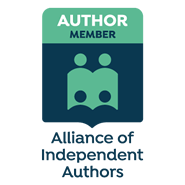 Author Website, Editing Website, Facebook Page, Goodreads Page, Amazon Author Central, Author Blog, Twitter, Amazon, Kindle, Barnes & Noble, Free Prequels, Book Trailer. If you can believe it, I usually have about three writing projects on the go at any one time. Right now I’m in the middle of edits for book 2 in the Chronicles Series, I’m researching for and plotting book 3 and I’m finishing up the first draft of an Urban Fantasy called “The Hollow Kiss” that I started writing last NANOWRIMO. That being said I’m also updating my eBook “Publicizing Yourself: A Beginner’s Guide to Author Marketing” which I plan to give away for free at my in-person workshop on Self-Publishing next month… Oh, and did I mention I’m also raising a 3 year old son? Now that’s a project and a half – lol! I always have an inkling about my characters. They actually develop from the plot! There’s a story I have to tell and I need to zero in on who is lurking in the shadows to best bring that tale to light. Often the plot and the character develop in those “murky recesses” in tandem of one another but not always. Take book 3 of the Chronicles Series… I always knew the premise: we’d look back into the past and see what sparked the failed revolution. I assumed initially that the main character(s) would be linked to the descendents focused on in book 2 but, surprise! Some of those people are there but they aren’t the ones who are supposed to tell this tale. I’ve discovered some truly remarkable characters who have a more compelling story than the descendents from the first books. Oh, tons! That’s how you make your work believable – by building in characteristics and emotional qualities that have made an impact on you. While the Chronicles Series is a Sci-Fi/Fantasy cross for Early Adult/YA Crossover readers and takes place on an alien world void of humans, that doesn’t mean they don’t face very real, very “human” issues. In fact, one of the best things about writing the fantastic is that often it’s easier to discover these issues in ourselves and our surroundings when we’re not bombarded by them in an overt way… they’re sneaky that way and can often have a great impact because you know they’re not trying to preach. The biggest connection I have in book 1 is with the main character, Taya. Ultimately she is a control freak and is used to getting her way – usually because she’s had the right training and actually knows what she’s talking about. But she’s also very naïve. As harsh a childhood as she’s had, it’s been sheltered and manipulated by others… part of what drives her need for control. And with everything that’s happened to her in her short life (she’s 19) you’d think she’d resent the world and just look out for number one – but no. She knows what it’s like to be abandoned, to no longer have someone looking out for you, to protect you and she doesn’t want anyone else to have to experience that… which ultimately gets her into a lot of trouble! These are the things we have in common – lol! As an English teacher you’d think I’d live and die by the sword – we’re all known, at some point or other, to “force” students to use character sheets to help them develop their characters. Why do we do it? Because they need to learn about how the little things are just as important (if not more so) than the big things. But that’s a lesson I’ve learned, so no, I don’t use them myself. Now, that doesn’t mean I keep everything I learn about my characters stuffed up inside my head and hope to the high heavens that I can remember everything – because I won’t. Ask my husband – if I don’t write something down or do it immediately, it’ll be forgotten about! I keep a story journal. As the characters come to life in my subconscious, I jot down everything I’m learning about them, from situations they’ve found themselves in to deep-seated feelings about things that they’re both aware and unaware of. From there, I slowly build the larger picture of who they are. Often I don’t entirely discover who they are until the story is done… and there’s 4 stories to tell in the Chronicle’s Series so I’m learning stuff all the time. I am mostly a planner. I like to know who I’m dealing with and the major points of what’s going to happen. I do broad, sweeping plans for the entire story and then, as I write each chapter I consider what needs to happen or to be learned along the way (by both the characters and the readers). The moments of free writing that happen usually take place within an outlined scene or chapter – something inexplicable happens… the characters do or say something that I hadn’t expected but it works. That’s when I learn the most about their motivations. Honestly, I know that it’s my subconscious at work but when it decides to reveal what it’s been working on, it’s truly magical. Traditionally “scraps of notes” get me started and then I compile everything into my story journal. Before I begin writing, I piece together a loose time-line for how I “think” the story will progress – given what I know of everything at that moment. Then, I create a graphic organizer that often looks like a flow chart smashed together with a herringbone organizer to show main plot vs. sub-plot points. As most of my ideas come from the research I do (yes, I write speculative fiction and I do research) and so those ideas get integrated along the way. For the Chronicles Series I developed a dictionary for alien terms/words and for my Urban Fantasy book/series I’m tracking which magical species will populate my world and how their hierarchy works – lots of fun! I do not “actively” look for inspiration. It usually just falls into my lap or I dream it. You see, I’m one of those lucky people who not only dreams in colour but I get to watch them much like a live-action film/movie. Some mornings I don’t want to wake up! But I keep a dream journal to track the best of them. These days I write where I can… or I guess I should say I “plot” and “research” where I can. I need silence to write. I need to hear my characters talking and if there’s music or some other white-noise going on in the background it’s often hard for me to hear what they’re saying. When I was younger I preferred to write all my first drafts by hand either out in nature or curled up in my favourite chair – these days I grab my laptop and squirrel myself away somewhere when I know I don’t need to keep my eyes on my child. One thing is for sure, I am not a morning person! Don’t ask me to function properly before 10am and definitely don’t ask me to be creative before noon. What I wish I’d known before I started was exactly how “real” editing was done. Sure, I’d done peer editing in my writer’s classes in high school and university and I took a whole bunch of grammar and reading courses but none of that could’ve prepared me for having to re-write my first novel (I was still learning best practices and my craft at this point) three times! And then, it still underwent a few dramatic changes once I was taken on by my publisher. I think, honestly, that having your novel “take over your brain” is a good thing J It immerses you in that world to such a degree that (for me anyway) all I want to do is write and write and write and get it out of my head and on the page… and that’s a good problem to have. It rankles my sensibilities that her grammar and sentence structure was laughable at best but stories aren’t just about words… they’re about the pictures, emotions and reactions readers gain from experiencing them. I’m not entirely put-out about her successes since it’s widely known that if you want to make a living as an author one of the hungriest markets out there is romance/erotica. She was in the right place at the right time with a story that resonated with those readers – ultimately, isn’t that what we all want? All of them? No, I’m lying. I wouldn’t save the poorly written ones even if they’re story was amazing… If I can’t get through a book without cringing at the grammar and sentence structure then it’s not worth saving. If I couldn’t save that many then I would likely be selfish and save my favourites. I have an eclectic mix that varies from Dickens to Bronte and Austen over to sticky-sweet romances that feed my girlish-nature to a myriad of heroes journeys in places of make belief and contemporary settings. I have no love for Homer or Sophocles and while Plato shaped our understanding of storytelling his teachings can be derived from any great book… we don’t necessarily need the first manual ever written on the subject. Personally I favour Stephen King’s “On Writing”, C.S. Lewis’ and J.R. Tolkien’s teachings, but then I think most people tend to favour the writings of their era. Well, this’ll sound like a broken record: Never give up. Give yourself permission to fail, to believe that you’ll never write for monetary reasons again; then, give yourself time to heal and try again. We learn the most important lessons from our failures. I think fanfic is an interesting niche market that should be taken for the compliment it’s intended to be. It’s wonderful to see how something we’ve created has (like Frankenstein’s Monster) come to life and evolved beyond us. When done right, I think fanfic is a great way to keep readers interested in your characters. If you’ve ended a series, what’s the harm in letting reader/writers live a little longer someplace they enjoy being? And, if the series is still going, it gives you (the author) a solid sense for what your readers want… give them what they want and they will come (to buy more books!). I am finding more and more that writers often have several creative outlets. Do you? Or is writing your one source? If I had permission to leave my responsibilities behind and only concentrate on the things I love doing, I would be a famous writer who sings for Disney, builds sets for the community theatre, sews gorgeous gowns to wear to the theatre after enjoying an afternoon of contemplative scrapbooking… practicing archery and doing acrobatic dance on the side. But the reality is that I can only focus on one of these guilty pleasures at a time. Well, I was (and still am) a teacher – something like that is intrinsically apart of who you are (to be good at it anyway). If I’d had the guts I might have tried to make it in the theatre world building sets and constructing costumes… that’s a huge love I always feared I was never as good as someone else at doing. But ultimately, if I had to do it all over again, pick my path, my future right out of high school… I’d get into publishing right from the start. I’d of honed my early editing skills and devoured book after book after book looking for the best of what came my way. Now that’s a job that appeals to me. I was nine years old. However, I was a very realistic nine-year-old (mainly due to that fact that my parents – who were separated – did their best to let me dream but not get lost in my dreams) and knew that I would never be able to make a living as an author. It’s only been in the last three years (since the birth of my son) that I’ve even attempted to make that unrealistic dream a reality. I don’t know that I can outright or consciously say that I “admire” a particular author for one thing or another. I have my favourite authors who I love to read and will devour almost anything they write in a given genre, and I have authors I respect for the sound advice and teachings they give. But I’ve never been one to get googoo-eyed over celebrities (never had a crush on a movie star – that jolt of reality being strong within me). The most conscious thing I’ve done to admire an author recently was re-read one of my favourite books before starting to write my own fantasy series. I wanted to absorb her words in a new way – as a student rather than as a reader. That was author Maria V. Snyder. Her world, her characters and her ability to craft an excellent novel drew me back to her… and I still love that book, even though I’ve dissected it from cover to cover! J. Moores began her career as an English teacher in Ontario, Canada. 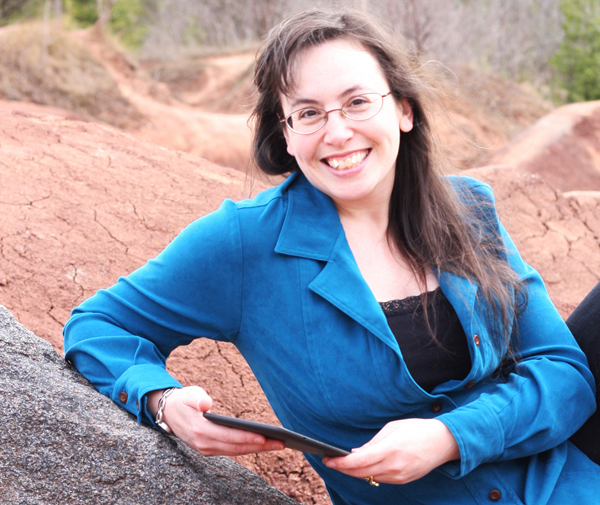 Her love of storytelling and passion for writing has stayed with her since the age of nine. M. J. relishes tales of adventure and journeys of self-realization. She enjoys writing in a variety of genres but speculative fiction remains her all time favourite. 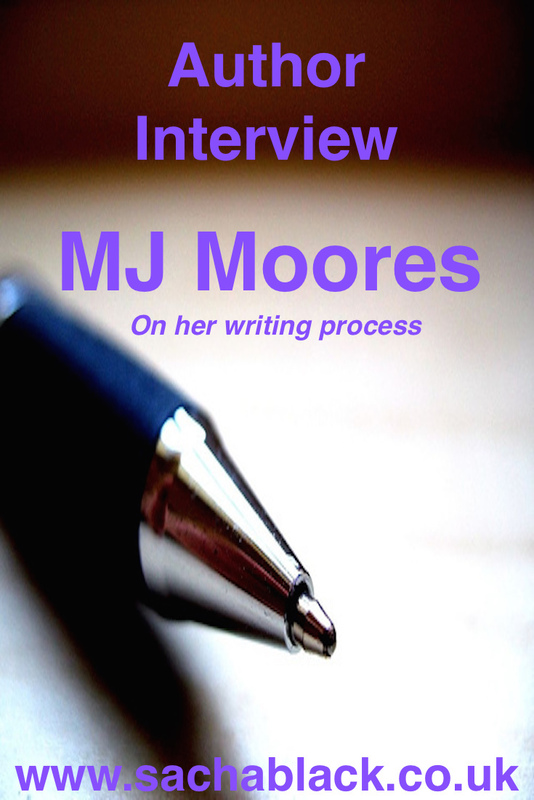 M.J. is a regular contributor to Authors Publish Magazine and she runs an Emerging Writers website called Infinite Pathways where she offers editing services and platform building opportunities. 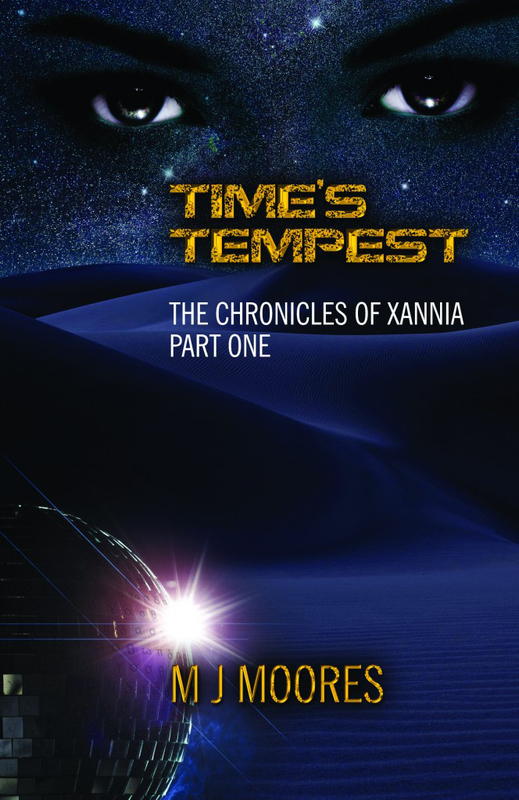 Her debut novel Time’s Tempest is currently available in print and on Kindle. I love reading your interviews. Your questions always give me a bit more of the author than most interviews do. Thanks so much for having me on your blog, Sacha. Your questions were infectious and I enjoyed delving into the various aspects of what writing and the world of publishing means to me. I wish you the best of luck with your own writing endeavors! You are more than welcome ? glad you enjoyed the process ?